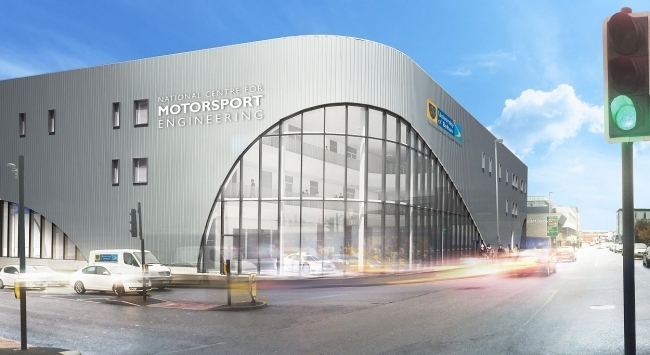 Construction of the University of Bolton’s new National Centre for Motorsport Engineering (NCME) is transforming a four-acre site in the heart of Bolton town. The £13 million 45,000 sq. ft. facility, designed by international architects Hassell, is on schedule to welcome its first intake of students this autumn. Three floors overlooking a central atrium include formal classrooms, technology centres, display areas and space dedicated to businesses; the building reflects the University of Bolton’s commitment to teaching-intensive courses, while working in partnership with industry to best prepare its students for graduate employment opportunities. The NCME’s facilities include state-of-the-art engineering and design equipment, including robotic workshops, carbon fibre laboratories and wind tunnels. The centre will also house mutually beneficial, co-operative activities with motorsports and automotive organisations, with students accessing real-world race teams and car manufacturing. The University of Bolton already provides degree courses through its established Centre for Advanced Performance Engineering (CAPE). The new NCME offers a B.Eng degree for those entering from A Level studies and a B.Sc for BTEC entrants, with both courses equally preparing students for roles in broader engineering fields including automotive and aerospace. The University of Bolton has a distinguished history going back to the 1820s and its roots as a Mechanics Institute: the town is twinned with Le Mans, the home city of endurance racing in France. The Earl of St Andrews was appointed Chancellor earlier this year, and the university was recently awarded silver status in the government’s new Teaching Excellence Framework awards.